Have you ever wondered who Jesus really was/ is?? Would you like to consider what is said about him in the Bible? Would you like to discuss deeply in BSL? Then this new course may be for you – its taught in BSL by Denise Flynn. 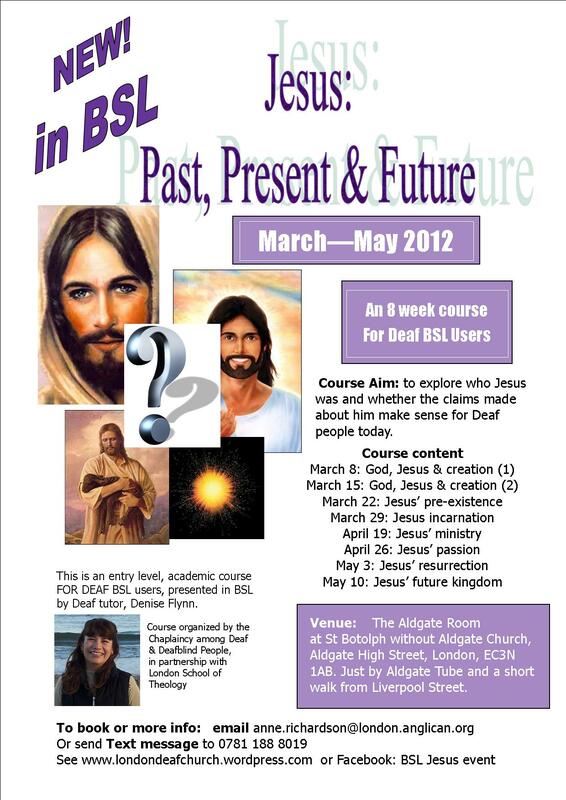 The course aims to explore who Jesus was and whether the claims made about him make sense for Deaf people today. The Course starts on Thursday 8th March 2012, 7-9pm and the last session is May 10th, 8 weeks altogether with a break for Easter. We are using the Aldgate Room at St Botolph without Aldgate, just by Aldgate tube station and a short walk from Liverpool Street.